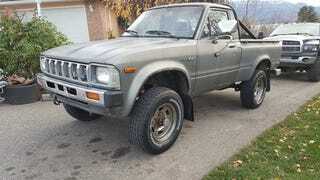 Here is a ‘83 Yota 4x4 for sale, with the rare Mirage trim/package. Now, as far as I can tell, they are indeed quite rare. They (maybe?) came in one color (charcoal). But there doesn’t seem to be much, if any, information on what made them so special. As far as I can tell, they are charcoal-colored SR5s with a big “MIRAGE” sticker slapped under the SR5 stripes on the doors. But does that make it actually valuable? The seller says one on ebay recently sold for $20,000. I’m going to just make a guess and say that it was probably completely immaculate, flawless, and had every decal on it, with low miles. His does not meet these criteria. Rare or not, what he’s selling is now just a used truck. This is cheap ... my debate is to spend 2500 repaint her ad the 300 decals and redo the seats and see if i can get over what the 83 sold for. If he really believed that he could spend $3,500 to get an extra $10,000, then he’d be stupid not to. But of course he doesn’t, he just wants to tempt you with the idea of flipping it. Even the tachometer appears to be broken. Furthermore, while it is more rare than the the Majove, it is not nearly as cool. The Majove got bronzed glass, different wheels, and that sweet, sweet paint on 2wd models. But no one selling these is asking $10k for a rough example. Anyway... I don’t like it when people try to slap obscene premiums on regular models that are only arbitrarily rare — namely, an SR5 pickup with special paint and two (TWO) extra decals. This concludes my rather mild rant.